The women decided to form a Rosary prayer group and they would gather every Sunday afternoon, at a flexible time to say the Rosary, sing hymns, read a chapter from the Book and recite the Act of Consecration to Our Lady. The Book contained very interesting articles about the church and what is happening in the world today which were foretold by Our Lady in Fatima in 1917. We had the privilege of being visited by Fr. Stefano Gobbi, the founder of the Marian Movement of Priests, who offered Mass in this Parish on 12th November 1993 which was attended by Cenacle members from other Parishes. 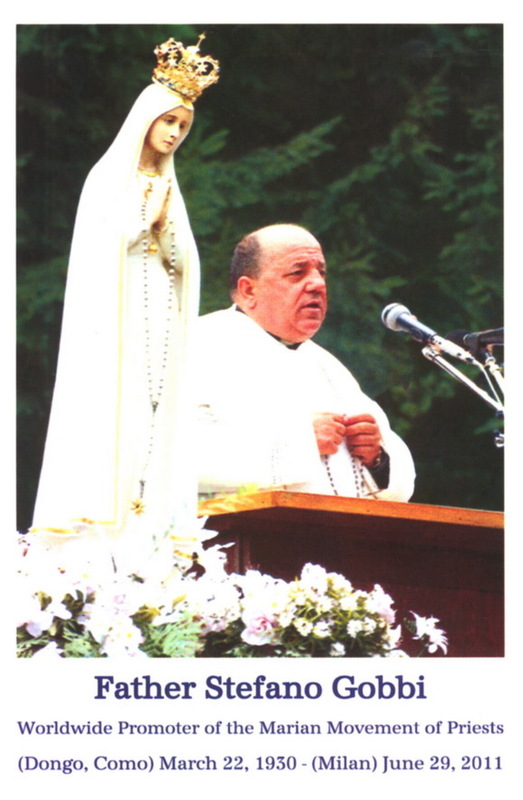 Father Gobbi was an Italian priest who traveeled the world to spread the Marian Movement of Priests. Over the years, new members would join the Cenacle but after a while, they stopped coming. The writer of this article is one of the only Founding members still with the Cenacle today. The rest have either migrated, moved to other Parishes, are house bound or have passed on. At present there are only three members and they still meet every Sunday at 2pm, pray the Cenacle Prayer and then at 3pm with others recite the Divine Mercy and then continue on with the Catholic Charismatic Revival Group and finally end with the World Aposlate of Fatima. Needless to say,the prayer session is very enriching to the members because they have been on the mountain with Jesus so truly the Sunday afternoon is well spent. Once a year, Fr Donal McElraith would organise a Cenacle for all the members to gather in one place and pray the Cenacle together.